What better way to relax and soak up your surroundings than on a wooden bench in the comfort of your own garden. The Emily Garden Bench from Zest will allow you to do this in style. Available as a 2 or 3 seat bench you are not restricted by space or size in your choice. 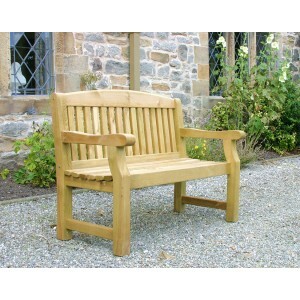 Attractively designed with a slatted back and smooth arm rests, this bench will look good in either a traditional or contemporary garden setting. Manufactured from pressure treated timber to prevent rotting, this sturdy garden bench is supplied with a manufacturer's 10 year guarantee. Home assembly required. A £15 delivery charge for this item will apply to the following mainland postcodes.